Hey all. I have an issue exporting to APK. In my test project I have.. In the windows player this works, but when I export to the device as an APK it just crashes on running. What am I missing to make this work? I know it must be simple but I can't figure it out (insert frustrated simian noises here) :-?? 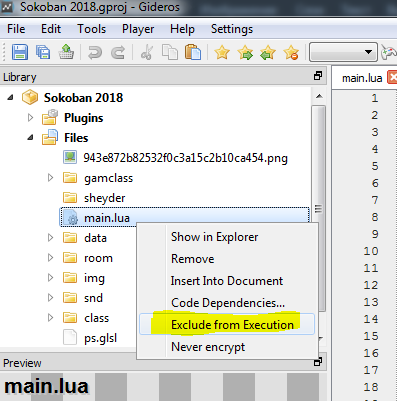 I ran Android Studio and in ADB the error is..
With the latest Gideros releases I think you need to set any file you require to "exclude from execution" in the library. Or whatever it's called, I'm on my phone. Yes, if you require or include anything then it should be excluded from execution, with the main programs. Hello! I didn't understand that. HOW 'include' or 'exclude' from execution? Why should I exclude what I need? Pointless! I'm having an issue I use "require bit" and it simply doesn't compile due to that! I also do not understand how to 'exclude from execution' someone who may know, would you please explain? Thank you! @Paulo777 All the files in the project that are Lua are compiled into bytecode into a single executable file. If you 'require' the file (without excluding it) then things get 'confused' as you already included it and you are trying to include it again - but it doesn't exist (as it's not in the apk).